The last few weeks have been very busy aboard Rendezvous. 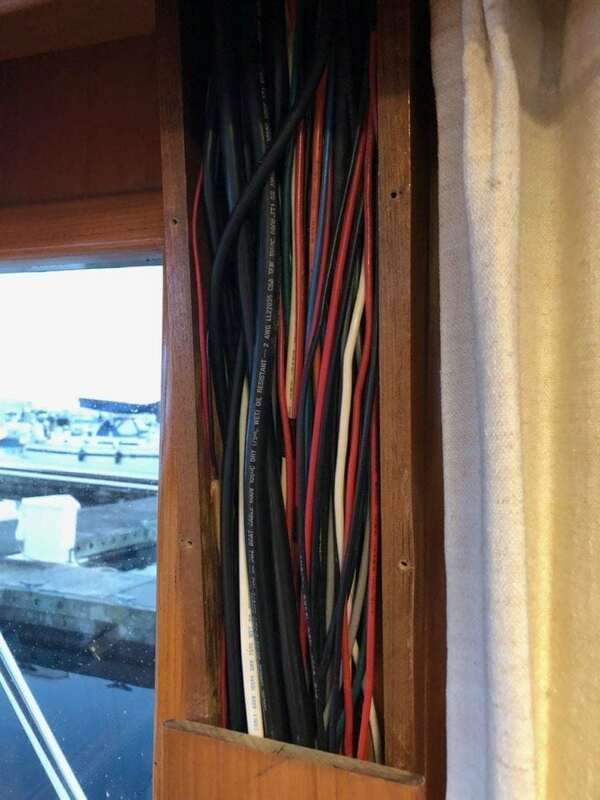 I have spent most of the time learning the boat, exploring wiring and systems setup, and working on some projects that were first on my list. I also had the chance to actually use the boat for a couple of trips, the last one being the longest and most exciting. One of the first projects I had on my list was updating the majority of the lighting throughout, as much of it was original or had been updated with LEDs with very harsh color profiles. I did similar projects on Grace with both Halogen light replacement with CREE LEDs and Ambient LED cabin lights. Rendezvous has a bunch of overhead lights that are thankfully not halogen, but older BAY15D non-indexed bulbs, which are pretty easy to get a hold of. I’m still playing with options from Dr. LED, LunaSea Lighting, and several other vendors for those lights. 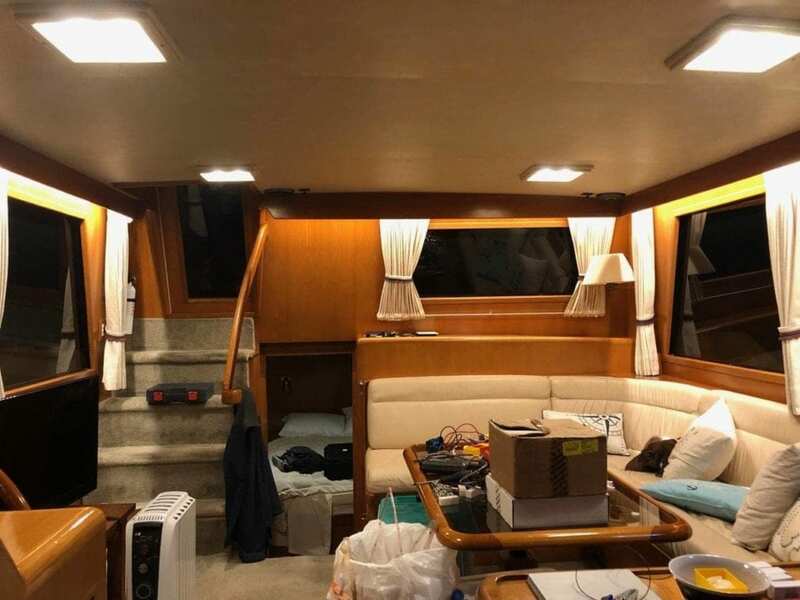 The overheads here have been updated with a couple of different brands and all are far better than before with nice warm light, and about 1/3rd more overall lumens. In addition, all around the edge of the salon under the valance where the curtains are was an older system of “courtesy lights” which were essentially a string of red LEDs. The salon itself would draw 5-7 amps just to run those lights! You can see above that I have already replaced them with something new…. I love ambient light, and here it has worked out wonderfully well with the already-wired and in place courtesy lights I was able to remove and retrofit. I used 16′ LED strips that are warm white + RGB along with mini controllers and remotes all from SuperBrightLEDs.com. What I like about this system is that the controller runs on 10-30VDC, so it can handle direct voltage from my DC bank without power supplies, allows for up to 5 controllers to be paired to one remote, and is very easy to install and wire. I could have just gone with warm white LEDs, but having the colors from the RGB side are nice both for practical and party purposes. 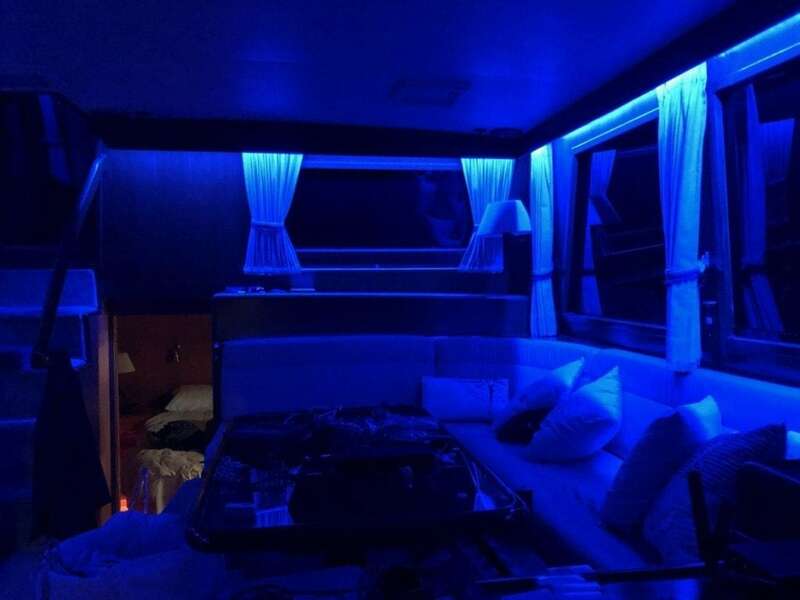 Dimming things down to the lowest red or blue makes it nice for night vision both while underway, or just for guests moving through the space. 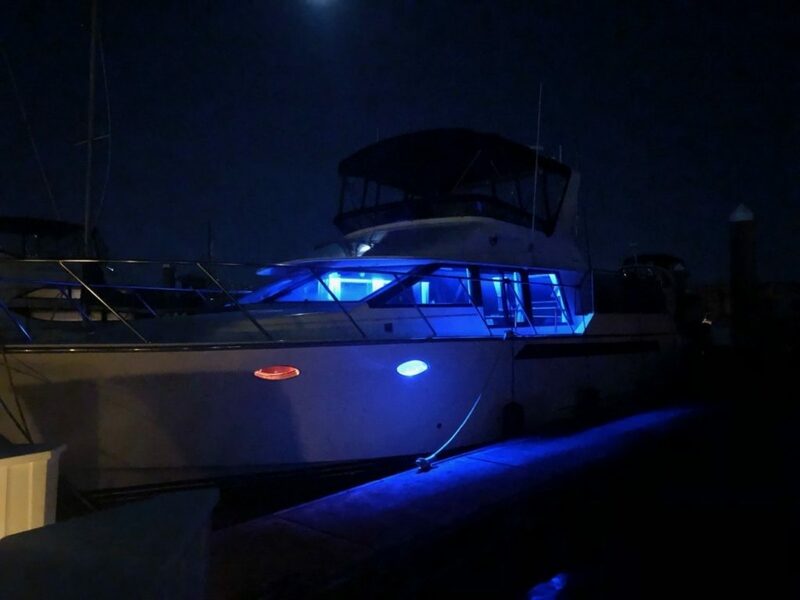 One nice side effect of the lights in the salon being so close to the windows is that they also light up the walkways on the boat, and splash a bit onto the dock! A very quick and relatively inexpensive upgrade that makes the space easier to use and more comfortable in general. One thing I continue to be impressed with is the little things that Ocean Alexander did when they built Rendezvous. 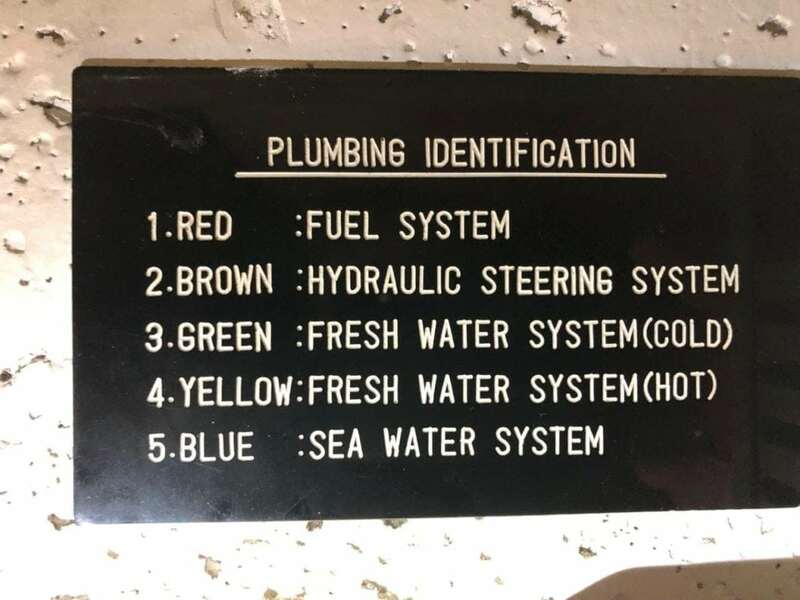 A single bilge system for a lot of the sources of bilge water is one of them, but so is their color coding system for piping, and the clear placard in the engine room in case you forget. For someone who is red/green color blind, I am pretty sure I need to consult other crew members before making changes lest I get things mixed up! One of the features that attracted me to Rendezvous was her electrically controlled lowering arch. I had the chance to test this out and explore all of the items on the arch, and I can say this is going to be super nice for working on antennas and other things I want to test and mount easily. It makes accessing everything super easy, and is just plain fun to use. There’s also a Furuno auto pilot system that I am debating keeping or selling, plus other bits that go along with all of the Furuno stuff. I’m hoping to find someone locally who would be able to use all of this as shipping it would be expensive. 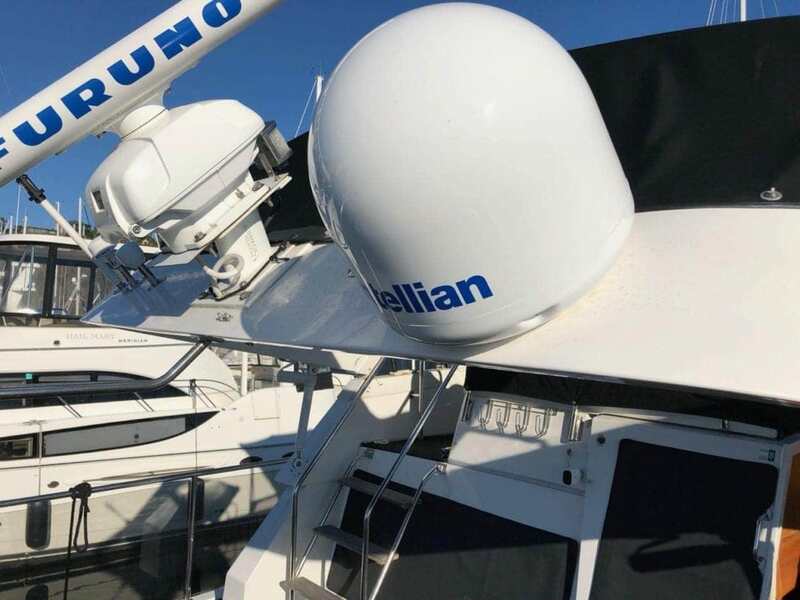 All of it works perfectly – it is just too big for my needs, and the radar itself blocks valuable space I would like to use for testing various other antennas and radars. The arch system makes it pretty easy to pull cables up to it, and there are even pull strings left behind! One of the first things I installed was the Magnum Battery Monitoring kit, which I consider critical in any electrical system. 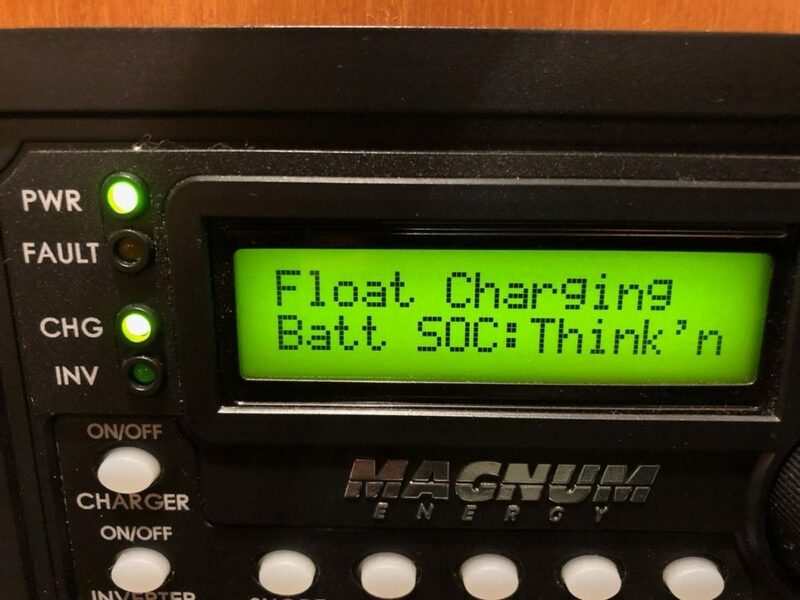 I’m surprised at how many boats I’ve visited and worked on that only have an inverter and the basic package that comes with, and no monitoring of the bank itself in terms of state of charge, current flowing in/out, etc. The BMK is a shunt and a device for $175 that will plug into your existing Magnum inverter and add all of that data for you. Mine was still calibrating, as you can see above. Once this was in place, I could see exactly how much capacity I had consumed out of my house bank, the current coming and going to the entire bank, not just what the inverter uses, and a few other bits and pieces. It is a simple upgrade everyone with a Magnum inverter should have. While exploring the electrical system, I came upon this mystery relay. I would not have known about it, had I not reached into a space that looked completely open with my bare arm, but I did. And the relay was happy to let me know it was there by passing 120VAC through the soft part of my wrist. Thank you. 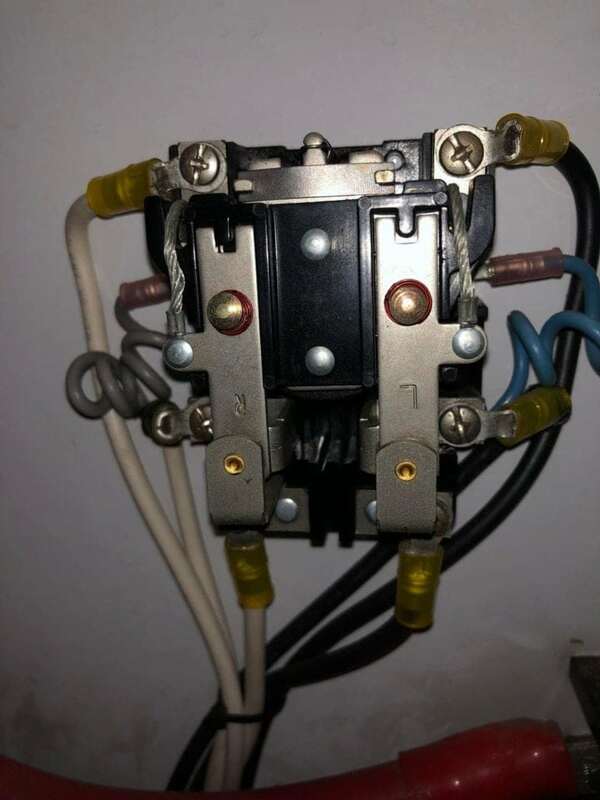 I was able to figure out this was going to a breaker on the AC panel which was OFF but is labeled E-Relay, which according to what I can find out, was used with some earlier inverter to switch between shore/inverter power. It does not appear to be needed, and in fact during sea-trial and survey we switched it on and had the whole AC panel trip. It needs to be removed, but I need to trace it a bit more before hacking away since it appears to always be energized. Continuing on the theme of wiring, much of my time has been tracing wires and figuring out where everything is going. I have a lot of things to install, and I want to ensure I have chosen the right places, and have access for future upgrades and projects I already have in mind. Much of the cable runs are easy to get at, save some in the flybridge eyebrow area that require a small child to reach. Compared to a sailboat, though, this is like paradise. I continue to be amazed at the sheer amount of storage space we have aboard. 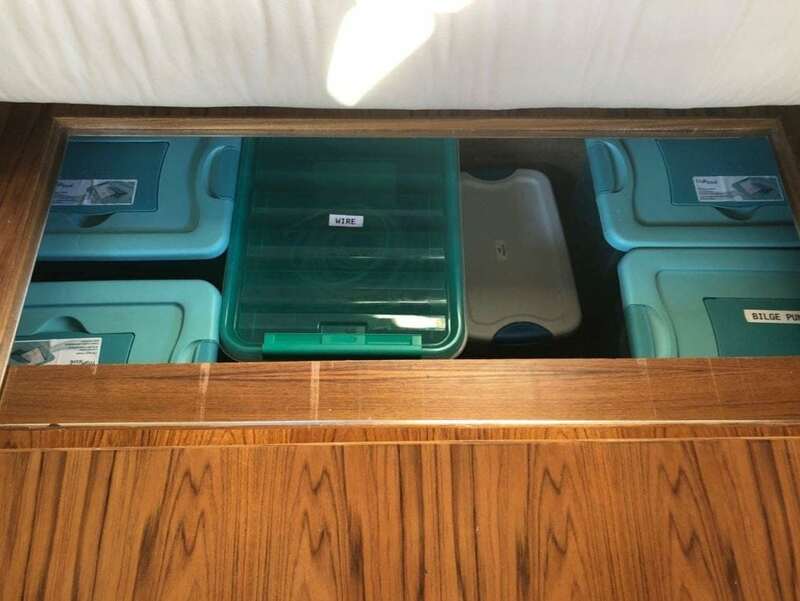 I have already emptied almost my entire storage unit into carefully organized bins throughout the boat in places that the crew would never need to access. 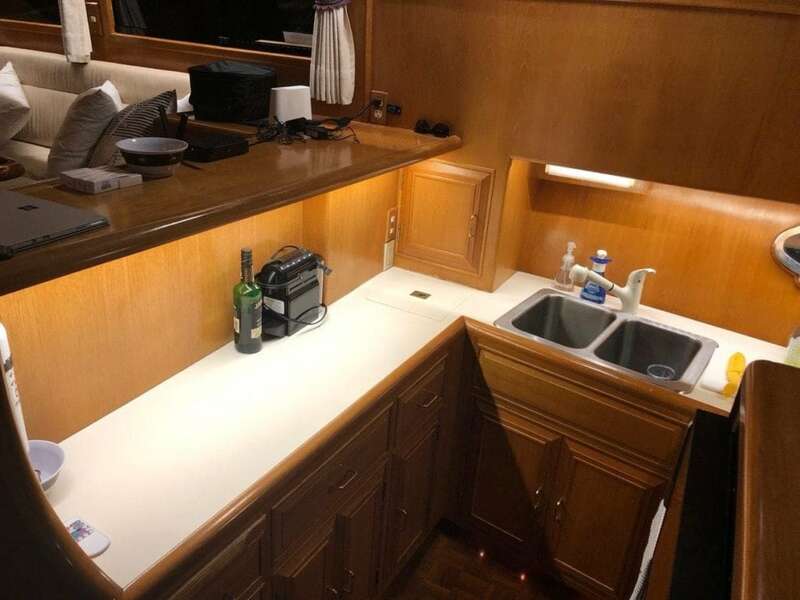 Even after that, there is plenty of storage for longer term cruising including areas like a full pantry, tons of space in the galley, copious drawers in the staterooms, and more. It is so nice to have everything aboard where I can find it if I want to work on a strange project, or if I need some random spare part. One other system I setup early on is my Siren Marine boat monitoring system. I was able to install it in the electrical closet and access voltages for both the start and house banks, plus I added an AC shore power monitoring relay. 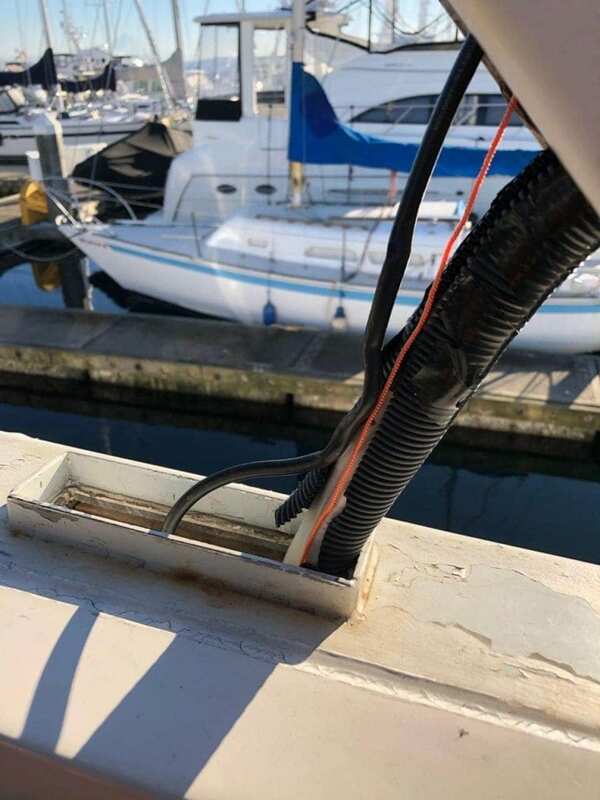 We have had a decent amount of challenges with the 30 AMP 120VAC shore power connection that the boat has – many other boats on my dock of similar size have 50 AMPs – in fact that seems to be the norm. Rendezvous only has 30 AMPs and when you have three 1500W AC heaters on throughout the boat, turning on anything else is not an option. I am considering upgrading to 50 AMPs in the future, but for now, Siren is monitoring things both while I am aboard and away, which with a new boat and lots of unknowns, is very comforting. Their remote wireless sensors are still being fine tuned, hence the red generator icon. The other big project was a full oil change of both main engines and the generator. I purchased a new Marco gear driven oil change pump to help with the job, and a few extra buckets and containers. The pump worked flawlessly, and made the whole process pretty easy. I had looked at the Reverso pumps which are faster and have some nicer features, but at double the cost I just couldn’t justify it. I expect to only be changing the oil every 100 hours or once a year, so perhaps in a year or two I can justify a full central Reverso system, but not now! 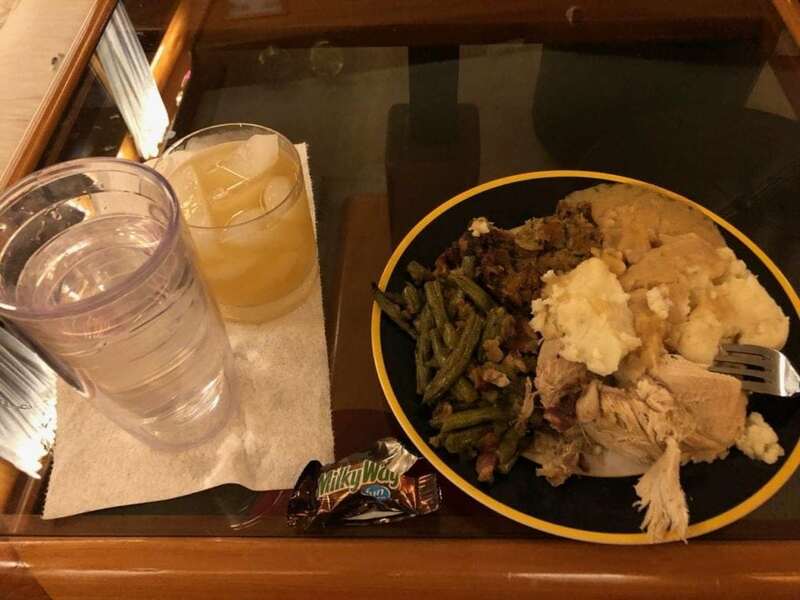 Crew member Jake and I had planned on getting away for 4 days after Thanksgiving, but the oil changes took too long on Friday, along with a few other projects, so we opted to have Thanksgiving leftovers at the dock and leave in the morning. We decided to cruise from Elliott Bay Marina to Poulsbo and anchor there. One of the other projects I was able to complete in a short time is to install a Vesper XB-8000 Class B AIS transponder I had in storage. I used the lower salon driving station VHF radio and antenna along with a splitter to get things installed. I will hopefully be testing some new Class B SOTDMA 5W AIS transponders soon which will fit here nicely. We anchored in Liberty Bay just off of the marinas, and our transponder was working great! I did have to work with the previous owner to release the MMSI he had already programmed into the DSC VHF at the flybridge. That required he cancel his station ID and MMSI which allowed me to claim it. An hour or so after we anchored, Sam Landsman of Slowboat.com stopped by to visit and see the new boat. He was anchored right near us, and we had been planning to connect for a while – it was great our schedules matched up, and good to catch up on marine tech geekery. 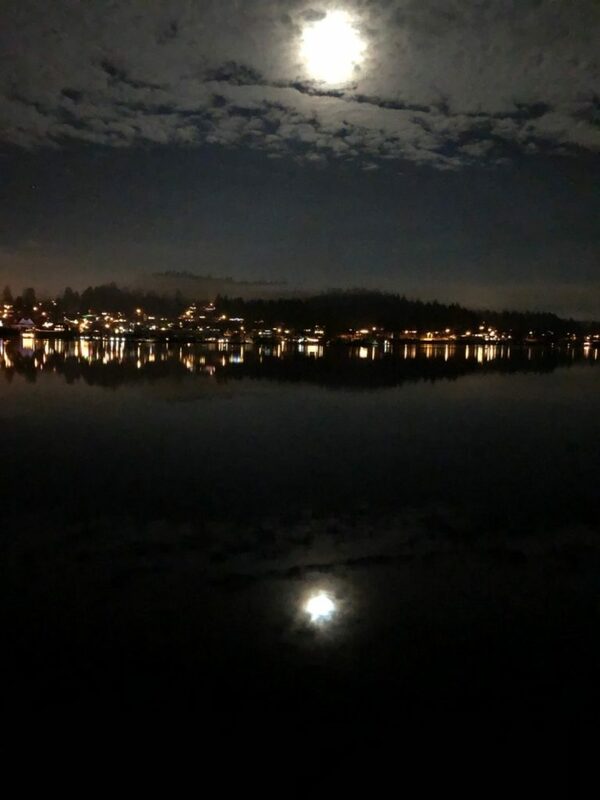 That night was calm as can be, and very cold. The anchorage had less than 10 boats in it, all spaced out very far, so it was a quiet and beautiful view of the holiday lights on the houses. It turned out that several of the ducts from our diesel heater had shaken loose, so we weren’t as warm as we would have liked, although it wasn’t bad. I fixed that the next day – boat projects never end! The next morning we dinghied in to the marina dock and found breakfast at the Green Light Diner. 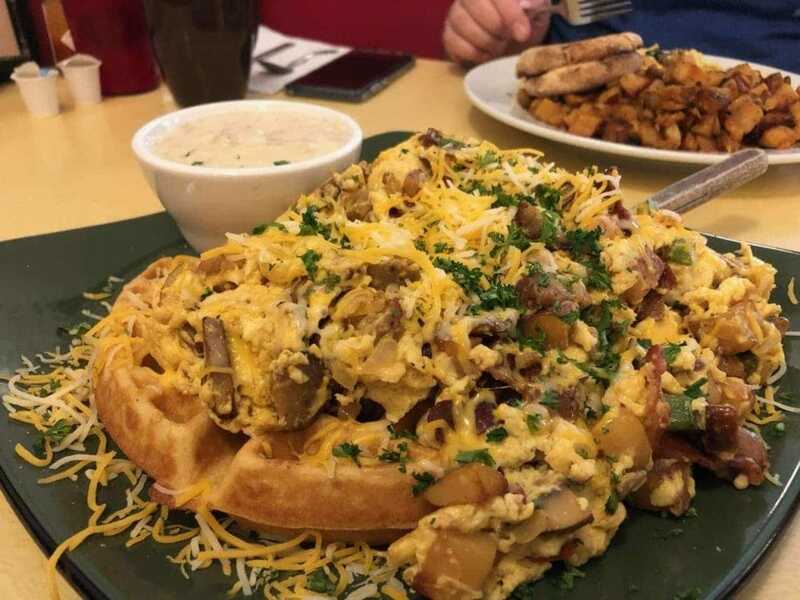 I got some crazy huge breakfast dish called the Kon-Tiki Traveler which is “A hearty scramble of eggs, red potatoes, peppers, onions, mushrooms, bacon, SPAM, sausage and cheddar, served on a Belgian waffle with a side of country gravy.” It was really good, but I probably should not have eaten as much as I did. 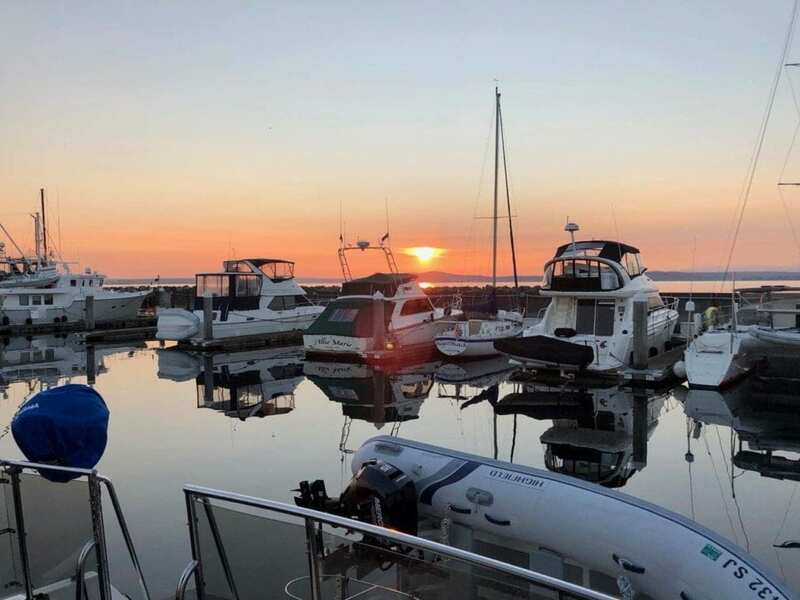 We left Poulsbo around noon intending on spending the night on anchor in Blakeley Harbor, one of my favorite short jaunts from downtown Seattle. The weather that night was supposed to be slightly windy, but the next day (Monday) was due to be really nasty, and we wanted to be close to Seattle to get home in the morning early. 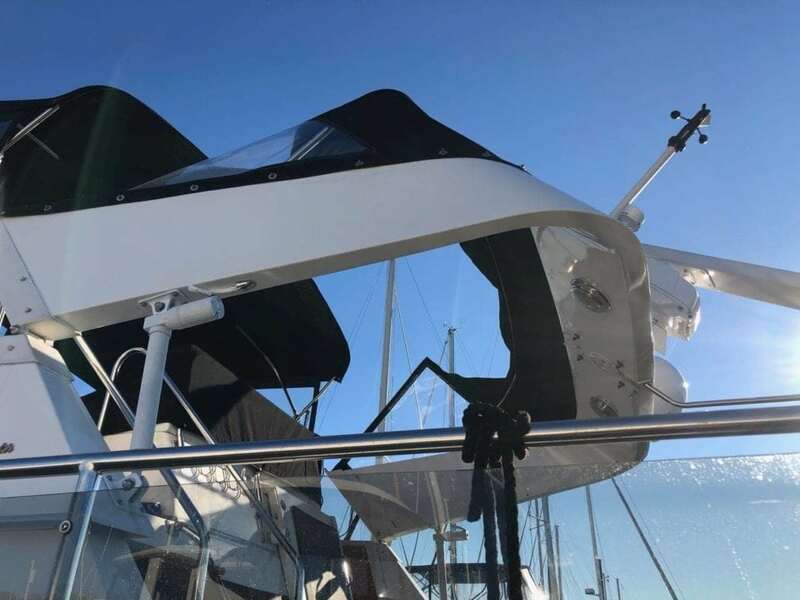 After a discussion the night before, we decided to use the flybridge keys to start the engines instead of the salon station, which I had been using normally. About 30 minutes into the journey, I was turning the wheel, and hit one of the keys, and shut off the starboard engine. Not good! 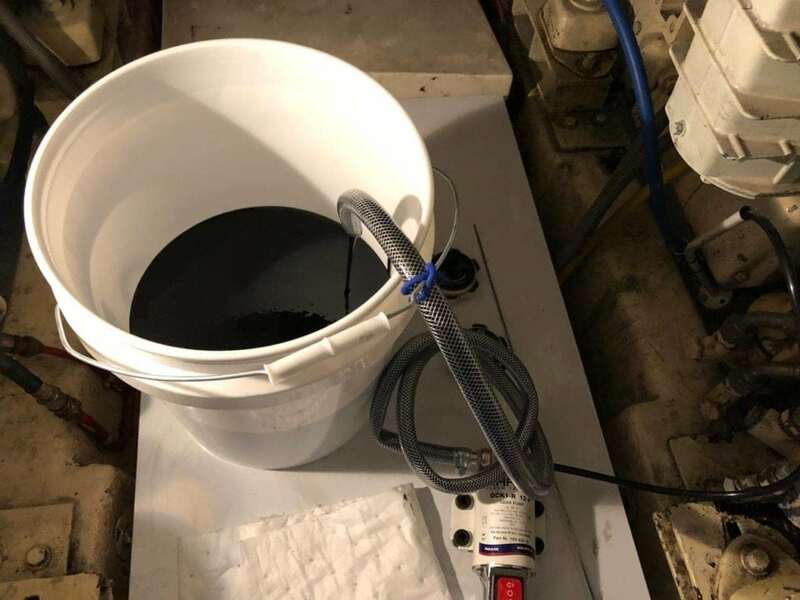 Shutting off an engine under moderate RPM is not a nice thing to do for many reasons – mainly because the engine is still hot and won’t be circulating coolant. I started it back up after coming to a stop, and checked everything, and we were back on our way. About 20 minutes later, I went below and immediately was inundated with a burning smell. I throttled down and inspected the engine room. We had been running the generator to help charge the batteries after the heater (which wasn’t connected correctly) burned through a lot of power overnight. I suspected that it was getting too hot with everything running, and shut the generator down. I also did an inspection of the entire engine room to see if I saw anything else, but didn’t. I did notice an abnormally high amount of current (50 amps) flowing out of our house bank, when it is normally 10-20 amps. I had bridged the house and start banks together to allow the engines to charge the house bank since I turned the generator off. Since this is still a new boat to me, I decided that it probably was OK, although strange, and continued on. We proceeded down Saratoga Passage and into Rich Passage around the south end of Bainbridge Island, destined for Blakeley Harbor on the other side. About 20 minutes passed, and all of a sudden ALL of the instruments on the port engine went dark. I tried turning the key off and on, but they did not come back. I could still hear the engines both running, and immediately throttled down. I went to the lower salon driving station, and it was similar there – no engine instruments, and no control of the state of the engine other than throttle and gear. I couldn’t turn the port engine off. I went into the engine room and there was lots of burning smell and a light smoke. After about 2 minutes of inspecting the port engine, which was still running by itself, I found a negative wire going from the starter up into the engine that had lost most of its sheathing, and clearly looked burned. I could see other things further up that were burned, but I couldn’t get to them without removing a floor panel above the engine. I made the executive decision to continue to Blakeley Harbor which was only 5 minutes away and to anchor and assess the situation. I discussed the options with Jake, and he agreed. We were on anchor only a few minutes later, and I shut down the starboard engine. We kept the engine room open and monitored things for any fire or additional smoke. I found the Volvo Penta manuals, and manually shut down the port engine using the overrides, as well as reset the tripped master breaker for the engine, which gave me control over it again. We were safe at anchor in a protected harbor only 25 minutes from our home marina, and I could start digging into what happened. I think this decision was far better than trying to continue 25-30 minutes, prep the boat for docking, and dock with an engine that was essentially running without the ability to control it completely. 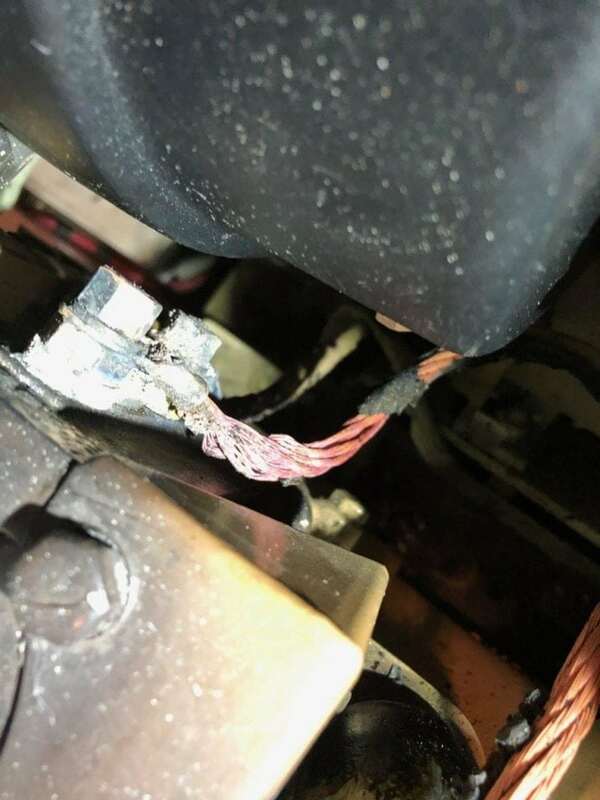 After shutting off all battery power to both engines and removing the floor panels, it was clear where the smoke and burning smell was coming from. What you see above is a solenoid responsible for turning on an element in the airflow of the engine, commonly called a preheating system. The positive wire (bottom large wire) and negative wire are both missing their protective hide for 6-8″ and the positive wire is touching the engine block, which likely caused the short that tripped the main breaker for the engine controls. The crazy thing is that tracing the large power wires revealed that they both go directly to the lugs on the starter with no fusing in between. After some research, this is apparently pretty common, but it does not make me comfortable. Out of the solenoid is the negative large cable which goes to the top of the preheater element, and then a second negative that goes from that down to the starter lug. 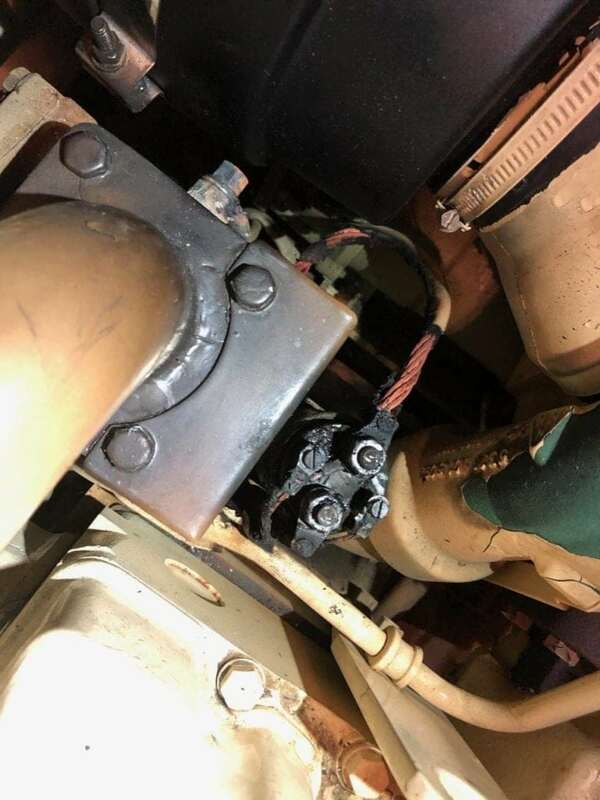 Its hard to see in this photo, but clearly the wire is missing its covering, and the preheater has obviously been running a while. 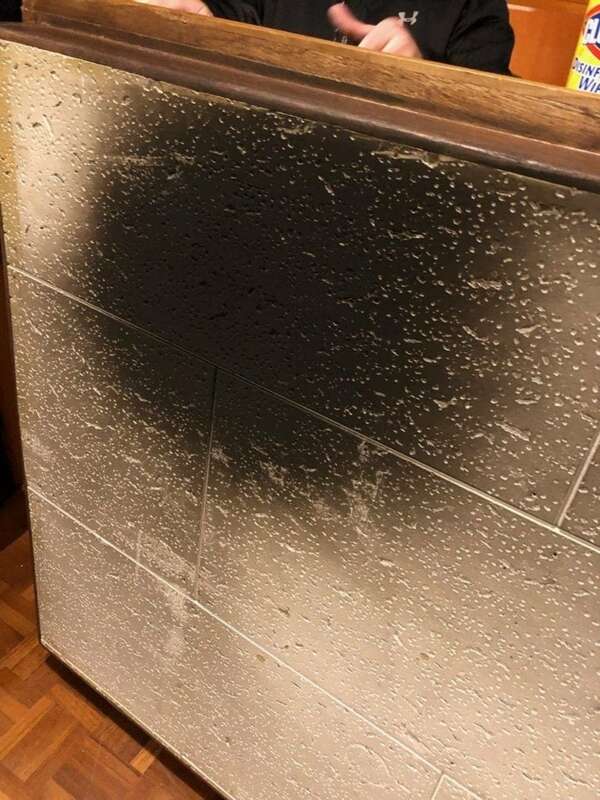 The bottom of the floor panel really shows the seriousness of what happened. That is a lot of black smoke, and it was everywhere – on the big air filters for the engine, across the other parts nearby, on the beams holding up the floor. I cleaned up everything I could, metered out all of the wires and removed the two large wires completely, and labeled and cut the control wires for reconnection later. I ordered a replacement solenoid, and we settled down for a calmer evening at anchor. After a lot of research, I determined that the preheater itself may not be something I would normally be using – Volvo Penta says the engine has to be pretty cold for it to be required, and in most cases it will just smoke more at start without it. I’ve posted a far more detailed description of what happened at BoatDiesel.com here if you want to read it. I am on the fence as to whether I will be disabling this system on both engines, or adding cutoff switches and fuses to prevent this from happening again in the future. I’m glad the damage wasn’t more extensive, but I will be adding a smoke detection system in the engine room as soon as I can. 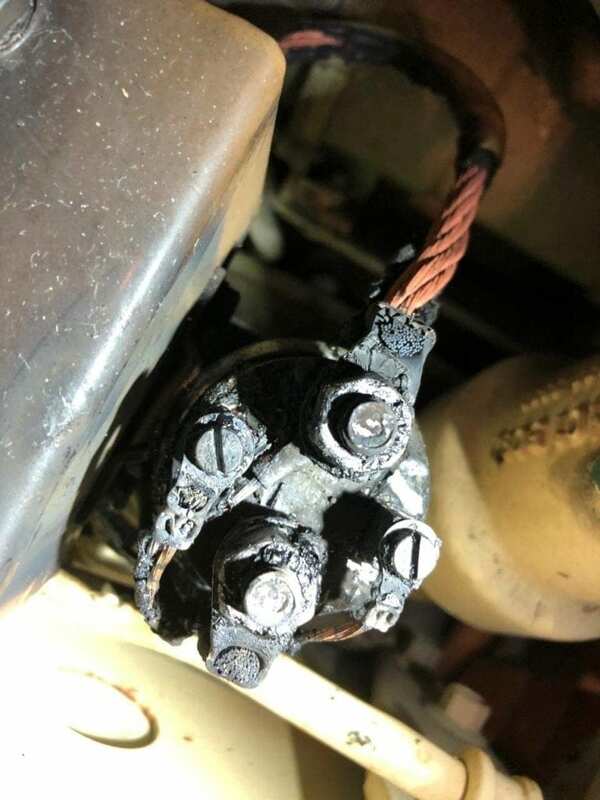 I believe we figured out the cause – the crappy key location at the flybridge and very loose tumbler likely resulted in me hitting the key into preheat at some point, at which point it happily ran for who knows how long and eventually heated up enough to consume the wire hide off of the larger wires, melt everything at the solenoid, etc. The system is only supposed to be used for a maximum of 60 seconds according to the manual, and likely ran for far longer. The rest of the evening was uneventful, and we got up super early on Monday morning to avoid the storm due in around noon. After a wet but calm 25 minute crossing, and a couple of docking attempts, we were safe at home. 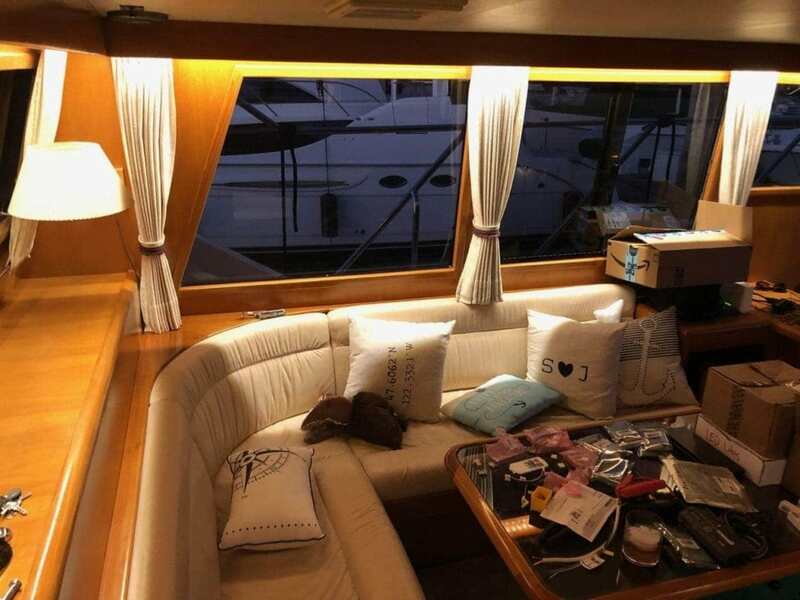 Although we had an emergency, the rest of the time was an absolute pleasure – empty anchorages and quiet nights with good company, good food, and so much comfort to enjoy winter cruising in. I will definitely be back out many times this winter!